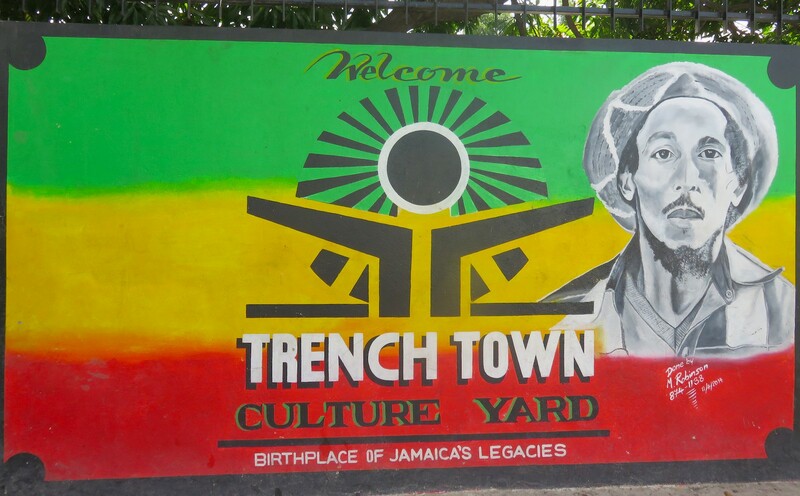 The Trench Town Culture Yard and Museum was officially opened on February 6, 2000, to coincide with Bob Marley’s birthday. It was the brainchild of community members on a crusade to regenerate Trench Town and share with pride their brethren’s contribution to Jamaica’s heritage. The Culture Yard, as the locals call it, is located within the humble government housing yard where Marley settled as a poor youth after moving from his childhood home in the rural hamlet of Saint Ann. Trench Town’s public housing projects were designed in the 1940’s to provide affordable homes with basic amenities like electricity and flush toilets for Kingston’s many poor. In the early part of last century this area of West Kingston had been the site of large squatter communities living roughly in shanty dwellings without proper plumbing or electricity. In Trench Town Marley found a community rich in musicians from the Kingston scene including Joe Higgs, an acclaimed recording artist, composer and arranger often thought of as the father of reggae. Higgs famously taught fellow Trenchtonians Bob Marley, Neville “Bunny” Wailer and Peter Tosh harmonizing techniques years before they became the internationally recognized reggae group, The Wailers. Other Trench Town residents in the 1970’s included musicians Desmond Dekker, Alton Ellis, Marcia Griffiths, Delroy Wilson, Jimmy Cliff, The Abyssinians and Vincent “Tarta” Ford. Tarta Ford ran a local soup kitchen and befriended the teenage Marley, becoming something of a mentor. Near the entrance to the Culture Yard, a group of guys smoking joints in the shade of an old mango tree look up and smile as I walk through the gate. With the music of The Wailers humming in the background, an eccentric glassy-eyed Rastafarian artist named Oswald “Stoneman” Comrie offers to act as my guide. The friendly Comrie speaks with unbridled passion and pride about life in Trench Town and his brethren’s accomplishments. This is definitely not a sanitized tourist experience. Though tidy and well-maintained, the Culture Yard appears desperately underfunded. Some of the posters are old and fading, but rather than detracting from the experience, it brings into focus the breadth of the longstanding poverty in this often forgotten part of the world. The museum’s first room explains the area was part of a large land holding during British colonial occupation owned by the wealthy Trench family who migrated to Jamaica from Ireland in the late 18th Century. Old aerial photographs dating back to the 1940’s show the genesis of what became Trench Town’s notorious government housing yards: the one and two-story concrete dwellings were built around a common courtyard with shared kitchen and bathroom facilities. Newspaper clippings from the late 1960’s and onward go on to describe the horrors of the regular politically motivated shootings in the midst of the extreme violence for which Trench Town became known. In the second room, large photos, posters and memorabilia showcase Trench Town’s many notable personalities. In front of a display listing all the musicians, sports stars and politicians who once lived here, Comrie urges me to take pictures of the lists, as if to embed into my head the enduring positive legacy emanating from the rooms in which we stand. Another room contains a glass case displaying one of the first guitars Bob Marley ever owned, and next door is a small sparse concrete room containing little more than a small single bed and a few personal items where Marley once lived. As we continue our tour, Comrie asks me to hold out my hand with my thumb and forefinger straightened. He then places his thumb and forefinger up to touch mine, and tells me this is the symbol of one love and represents the “One Love” Marley sang about. With his fingers resting against my own, Comrie says slowly, “I love love. One Love. When Bob come and sing about one love, it’s the principles of what he learnt from us as Trenchtonians. We are the ones who have teach him about that love.” It’s clear Comrie takes pride in aligning himself with the enduring legacy of the legendary Marley. Comrie’s small artist studio overlooking the communal yard is crammed full of fabric paintings of intricate psychedelic patterns carrying messages of peace, justice, hope and survival. Behind the studio his prized collection of large stones and a ram’s head skeleton are carefully laid out. He believes they come from “the womb of realization and civilization” and explains with conviction his interpretations of the shapes and markings on each individual stone. I try to follow as best I can. In a serendipitous moment, an aging Rastafarian named George Hedley Robinson appears at the Culture Yard. While Comrie introduces me to this man known as “Georgie,” he tells me Georgie used to live here in the yard and was a close friend of Marley. 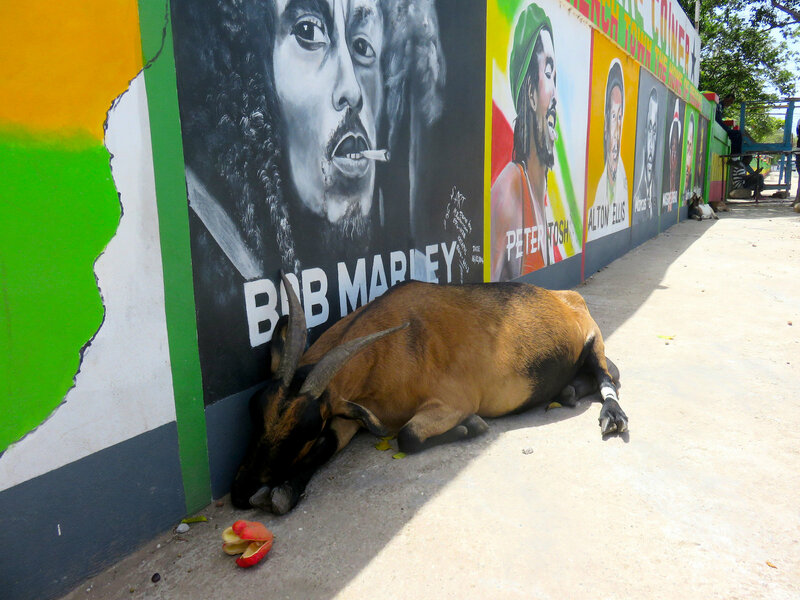 As I talk to Georgie, I realize this softly spoken Rastafarian with a long beard and battered clothed is the man immortalized in the lyrics of the famous song, “No Woman, No Cry” about life in this very Trench Town yard. Legend has it, when Marley and his bandmates got too hungry to keep rehearsing, Georgie would cook up cornmeal porridge in the early hours of the morning to sustain his younger friends with food in their bellies so they could keep jamming. These days Georgie lives in a small house Marley bequeathed to him in the up-market Kingston suburb of St. Andrews which houses the Bob Marley Museum and Foundation. Bob Marley died at the height of his career from melanoma in 1981 at the age of 36. His politically charged lyrics spoke of the harsh reality of the ghetto sufferer and to this day continue to resonate with fans of all generations worldwide. Often remembered as the first Third World superstar, through his music he voiced issues of race, human rights violations and the suffering of the oppressed. He tried to galvanize political leaders in his homeland to end the insidious, violent nature of Jamaican politics, and campaigned against apartheid in South Africa. In a testament to the far reach of his music, in 1978 Bob Marley was awarded the United Nations Medal of Peace. Sitting on a step with Georgie and Comrie, outside the small room where a teenage Bob Marley was taught guitar by Tarta, the vibes running through the Culture Yard and the poignant history captured here move me to the brink of tears. The spirit of ghosts long gone strangely present. A while later two musicians from contemporary reggae band Lyvin Kulcha, singer Ziggy Soul and drummer Eric ‘TwinRock” Samuels, arrive at the Culture Yard to begin rehearsing. In their office/recording studio housed in adjoining rooms, they invite me to sit in as I descend deeper into the magic of this Caribbean morning. Trench Town-born Ziggy Soul was a prodigy of Bob Marley and found fame as a member of reggae groups Earth Disciples, True Change and the US-based Wailing Souls. In the mid 1990’s he renounced his faith in Rastafarianism and answered a calling to become a born again Christian minister. These days he divides his time between musical projects and his not-for-profit organization, Ziggy Soul’s Children Outreach Ministries, helping Trench Town’s needy children through education, clothing, counseling and financial aid. When the rehearsal is over, Ziggy takes me for a walk through the downtrodden streets of Trench Town. He warns me not to take photos of anyone without asking. The reality of the poverty is obvious. Many houses appear rundown and numerous derelict cars have been abandoned. Our first stop is a kindergarten nearby called Victory Basic School run by Ziggy’s ministry where we are welcomed into the clean colorful classroom by a cheerful teacher and a group of happy children. Back on the road, with the late morning temperature soaring, we stop for water at a corner kiosk en-route to the Jamaica Music Institute (JAMIN) recording studio on Fifth Street. Even though it’s not quite midday, we opt instead for a cold Red Stripe beer. Arriving at the studio, beer bottles in hand, we meet a young sound engineer sitting at the mixing desk alongside local musician Ras Dias. As music fills the air the vibe is one of collaboration and goodwill. The studio manager, a young woman called Kadine Johnson, tells me they have two certified avid trainers to teach aspiring sound engineers on the state-of-the-art equipment. After an hour and a half in the studio, Ziggy says it’s time to go. Reluctantly I leave and say a silent prayer to return one day soon. 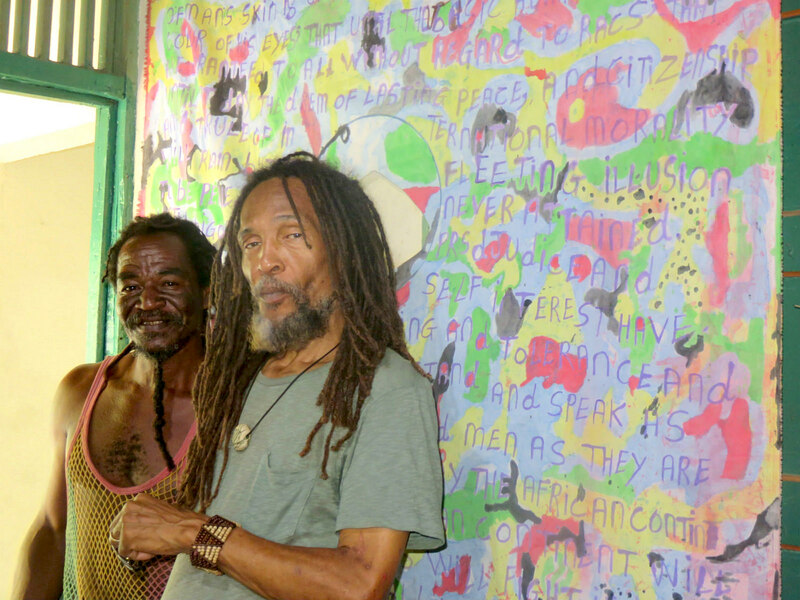 The spirituality captured at the Trench Town Culture Yard and Jamaica Music Institute leaves me burning with hope efforts to regenerate the area continue. Go to Trench Town with an open mind and an open heart, and you’ll ride a magical carpet with people who embody the spirit and soul of this iconic pocket of the isle of Jamaica. Tamara Lowe is a writer living close to the water’s edge in Sydney, Australia. In a different life, before her children were born, she had a rewarding career as a classical homeopath. Earlier this year she founded the Caribbean Children’s Cricket charity dedicated to helping under-resourced primary schools in the cricket-playing Caribbean islands. Her blog can be found at Aretheretoysinheaven.com.